Wash the Okra and air dry them or wipe them dry with a napkin. It is necessary that the okra is dry before we use them.Remove the top and end of the Okra. 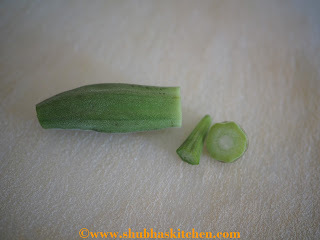 Thinly slice the Okra into thin slices. Heat 3 tsp of ghee / clarified butter in a wide mouthed pan. 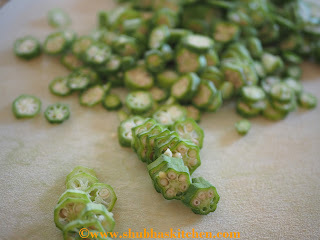 When hot, add the sliced okra. Sprinkle little salt and fry until the slices get nicely roasted. Cook on medium heat. This takes a little time but believe me its well worth it. Once done, set it aside to cool. 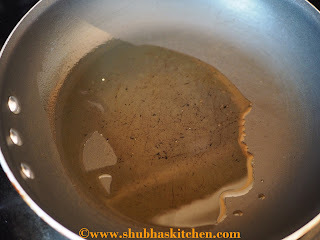 To prepare the tempering, heat the ghee. 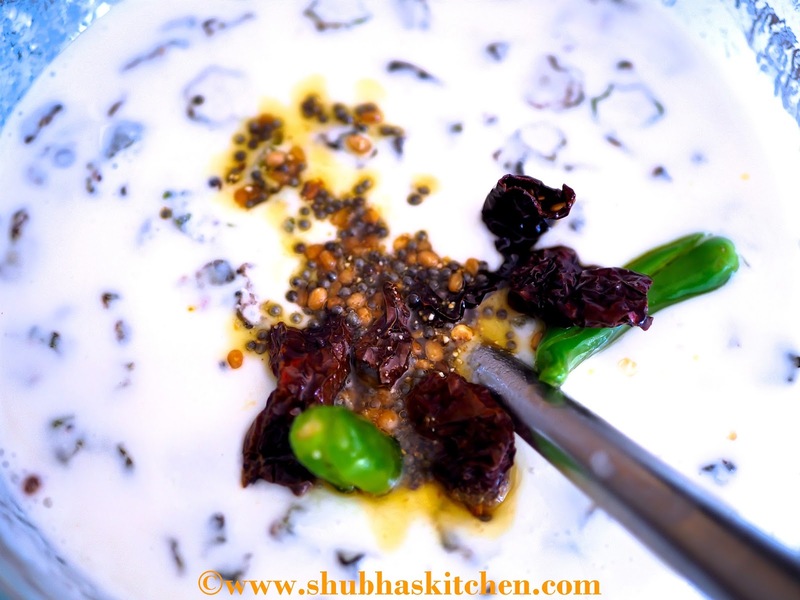 When hot, add the mustard seeds, urad dal/ split black gram, dried red chillies, slit green chillies . 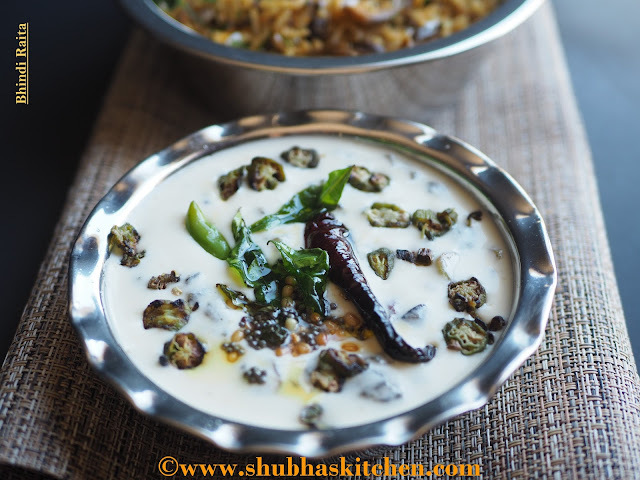 When the seeds start to splutter, add the asafoetida and curry leaves. Turn it off and set it aside. 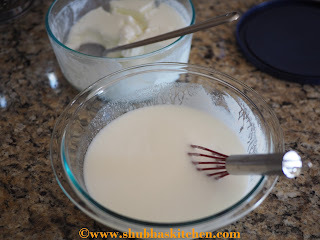 Take yogurt in a bowl. 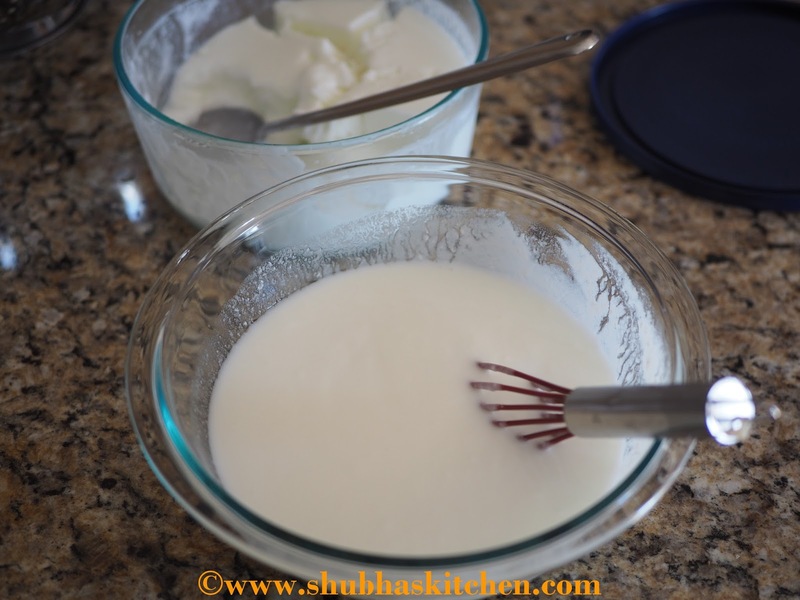 If the yogurt is too thick, dilute it a little with water or milk. Whisk it well. 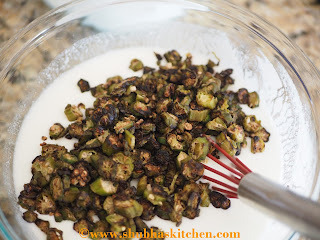 Add the roasted okra . 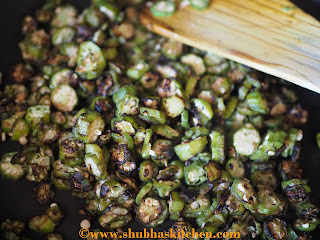 Adjust the salt (Remember, we had sprinkled some salt to the okra while roasting. So add accordingly.) Lastly add the tempering and serve. NOTE: This raita is best served fresh. It gets a gooey texture when it sits for a long time. Hence, serve fresh. 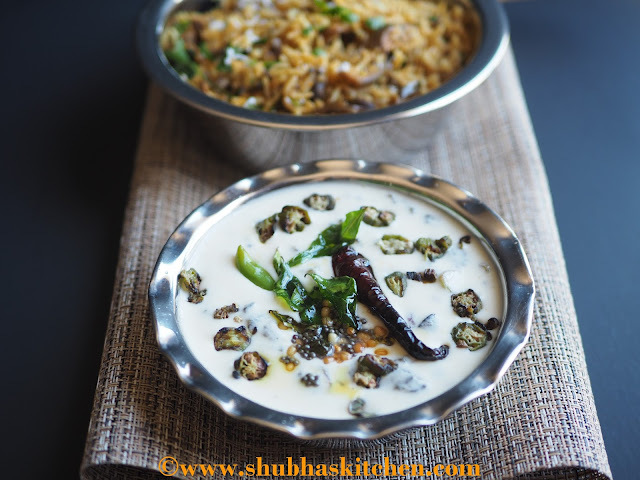 Such a delight... A perfect combination of ingredients and so creamy! 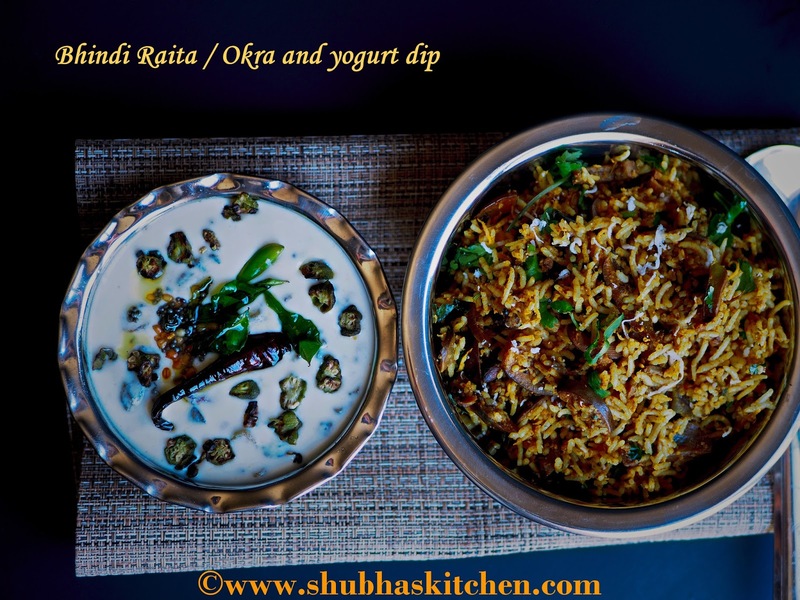 We make something similar by adding fresh coconut paste and it's called Hashi.. Looks amazingly delicious! Nicey-nicey. 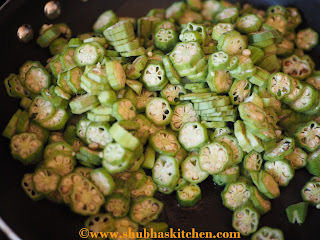 Something new for me and this is great way of showcasing the okra. 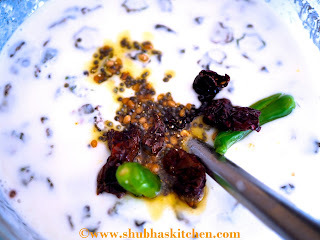 My favourite raita...I love anything with bhindi...looks so delicious! !